I was screwing around trying to take water drop photos at the Huntington Gardens on Sunday when my partner Julie had the real find of a day: a ladybug inside a pinkish rose. I managed the above shot with the used Nikon 85mm DX micro lens that I recently picked up at a local camera show. It's great for macro shots (Nikon calls it 'micro' for some reason) but not the easiest thing in the world because the lens has a paper thin depth of field when used for close-up photography. I took this shot with the camera on a tripod and using a remote shutter release; the camera was probably eight inches or so from the ladybug. Camera settings: ISO 400, f/8 and 1/500 shutter speed. There was also a bit of a breeze, meaning that even using manual focus, the ladybug was swaying in and out of focus. I used my Nikon D5100's built-in flash for a few shots but didn't like the way it looked -- it definitely helped to throw some light on the insect but also was washing out the rose, which was light colored to begin with. If I had a remote flash, I probably would have held under the rose to see what kind of effect that had. I also might have tried using my iPhone's flashlight to get a little more light deeper into the flower. I didn't think of that until I was home later. Whoopsydoodle. 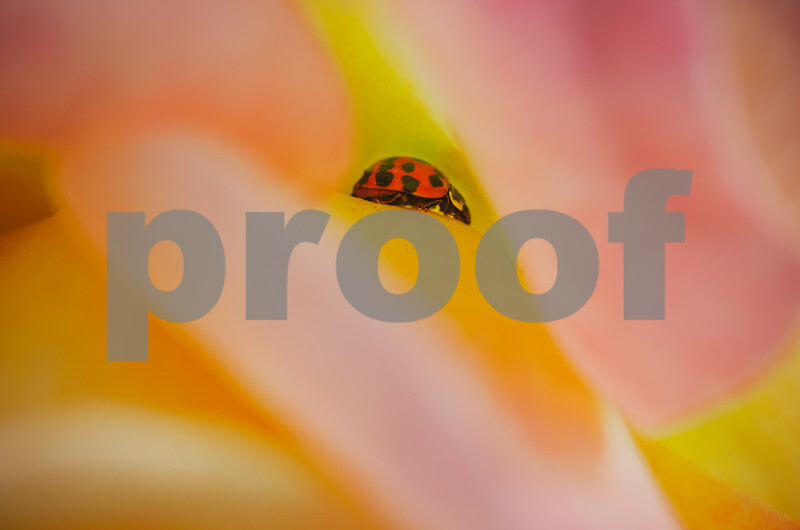 There are other versions of the photo, some of which include the flower's edge. But I like this approach best. It's a little abstract, but that's kind of the point showing a bit of the colorful and miniature landscape inhabited by ladybugs.